Donors’ gift often provides a variety of tax breaks for charitable action. There are several ways available to help benefactors based in various countries to make tax-efficient donations to AUBG. In the U.S. our donors can give to AUBG as the university is officially recognized as a non-profit organization, determined by the United States Internal Revenue Service to be a tax-exempt public charity with 501(c)(3) status with US Federal Tax Id No. 01-0466768. The University is able to issue gift receipts for US tax purposes. In Bulgaria, our donors can make a gift to AUBG as the university is officially registered as a non-profit organization on the basis of art. 18 of the Law for Non-Profit Legal Entities with judgment no 1351/29/05/2006. Every donation is tax-deductible and the University issues receipts for Bulgarian tax purposes. In Europe AUBG can also receive tax-free contributions from donors living and working across Europe. The Transnational Giving Europe network recently enabled our academic institution to extend fundraising campaigns to 19 European countries (find a full list here), without having to set up branches or sister organizations for that sole purpose, and without having to master different national laws. 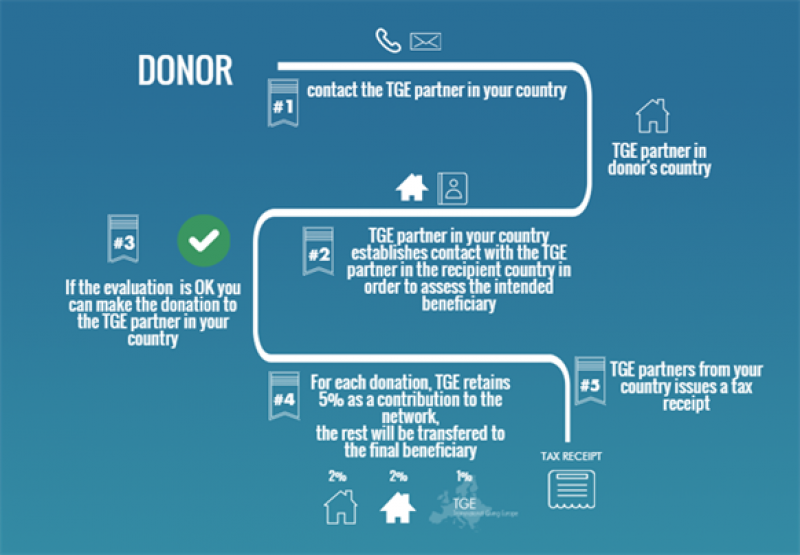 Transnational Giving Europe (TGE) is a partnership of leading European foundations and associations that facilitates tax-efficient cross-border giving within Europe. The TGE network enables donors, both corporate and individual, residents of one of the 19 participating countries, to financially support the American University in Bulgaria, while benefiting directly from the tax advantages provided for in the legislation of their country of residence. TGE carries out all administrative tasks related to the tax deductibility of gifts. Depending on the country’s tax laws, TGE partners will fill in all relevant tax forms and deliver, whenever applicable, fiscal receipts testifying to the contribution made. 1. Reliable Framework: TGE offers the comfort of a network of prominent grant-making foundations, anchored in each of the countries covered, where they have outstanding relationships with AUBG and enjoy the confidence of national authorities. They ensure your contribution is allocated to AUBG. 2. Quality Review of Beneficiaries: TGE partners’ long-standing experience as grant-makers and extensive knowledge of the non-profit sector in their home country serve your generosity. Their involvement with your gift is your guarantee of the quality of the project and AUBG. 3. Tax Effective Cross-Border Giving: Your cross-border donation receives all applicable tax benefits in the country where you pay taxes. The Partner foundations’ combined expertise in domestic tax laws secures the most effective tax treatment for your gift in both your own country and Bulgaria. 2. Your national foundation will establish contact with AUBG and BCAUSE, the partner foundation in Bulgaria, to inform them of the incoming donation. 3. If the evaluation is positive, the donor makes the gift to their home-country foundation which then provides the donor with a tax receipt and transfers the gift to AUBG. Please remember to include the structured communication << TGE-American University in Bulgaria-BULGARIA >>in all your donations by bank transfer. 4. A 5% contribution is taken on the donated amount for gifts up to €100,000. For higher gifts, 1% of the amount in excess of the €100,000 is charged. The maximum operational cost is €15,000. Banking fees are invoiced when actually incurred. When a UK taxpayer makes a gift to AUBG through TGE’s local partner, CAF, the University can take advantage of the UK government scheme GIFT AID and reclaim the tax that the donor has already paid on donations through UK income tax or capital gains tax. The benefactor must note that CAF will share relevant and necessary data with HM Revenue and Customs to enable AUBG to reclaim the Gift Aid on their donation. To be able to make this donation tax effectively using the Transnational Giving Europe (TGE) service via CAF, the donor has to sign a Gift Aid Declaration and International Gift Request Form and return everything to CAF along with the check-in sterling drawn on a major UK clearing bank.